We are a leading Exporter of heliconia plant and foxtail palm from Pune, India. Heliconia are grown for the florist's trade and as landscape plants. These plants do not grow well in cold, dry conditions. They are very drought intolerant, but can endure some soil flooding. Heliconias need an abundance of water, sunlight, and soils that are rich in humus in order to grow well. These are available as per the specifications provided by our clients. The plants typically flower during the wet season. Wodyetia bifurcata, the foxtail palm, is a species of palm in the Arecaceae family, native to Queensland, Australia. It is the sole species in the genus Wodyetia. 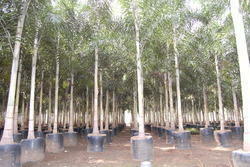 "Very attractive palm with long (2-3m.) plumose leaves (hence the name 'Foxtail'), and up to 10m tall with a grey trunk. It produces large (about the size of a duck egg) orange fruit"